The Brabant Ensemble have become something of a hot-ticket over the past few years and have been steadily demanding more and more attention within the early-music community since they started in 1998. It was in 2006 that they firmly staked themselves out on the map when their recording of Crecquillon was awarded a 'Choc du Monde de la Musique' and received overwhelmingly enthusiastic reviews. 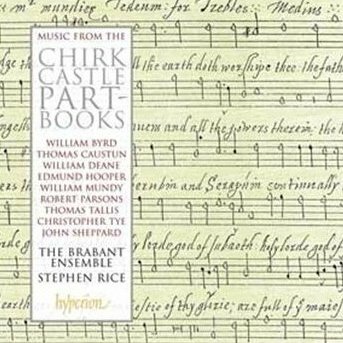 Three years on and much music-making later, their newest disc, Music from The Chirk Castle Part-Books, is, I am sure, set to become a firm favourite in what is already a healthy year for early music recordings. Chirk Castle, near Wrexham was begun by Edward I in 1294 and has guarded the Welsh valleys of Dee and Ceiriog for over 700 years. It was bought by Sir Thomas Myddelton in 1595 and subsequently given to his son, also Thomas, who instituted choral services in the chapel. William Deane –the organist of Wrexham Parish Church – who was appointed to the castle's chapel following the restoration work of 1630 - began the part-books from which the music for this album is taken. Choral services were interrupted by the Civil War and resumed after the restoration of the Monarchy in 1660 when the part-books were once again in use and music copying resumed. Amazingly for such an important source of pre-restoration music these books remained in the castle library for about 300 years until, in 1969 they were sent by the Myddelton family for auction minus their organ book (which had at some point migrated to Oxford) and also lacking the quintus book which is sadly lost. The Brabant ensemble have used 12 singers which is roughly the expected size of the choir at Chirk and the editions are by David Evans (with assistance), who also provides the excellent notes for the album booklet and the reconstructed treble-parts in the Te Deum and Benedictus 'for trebles' by William Mundy opening the album. In many ways, this first setting is one of the most exciting in the programme, not only is it something of a 'new find' musically but the Brabant Ensemble make such a sublime sound right from the very start that one knows instantly that this disc is quite special. One of the keys to the success of their choral sound lies with the sopranos Kate and Helen Ashby; their clear and resonant voices, aided by the fine acoustics of Merton College chapel in Oxford, allow the high singing to be deliciously well executed without any hint of discomfort or monotony as can sometimes be the case with this style of music. These settings by Mundy are absolutely delightful and I would hope that this reconstructed setting will be heard more frequently from now on. Stephen Rice maintains this well-balanced texture throughout the programme and although I can hear the influence of The Clerkes of Oxenford/David Wulstan and, more obviously, The Tallis Scholars/Peter Phillips, the sound of his young singers is definitely their own. Even in the better-known pieces by Tallis there is always something new to be heard and I think this is also due to the quality of editing as well as the performances themselves. Just enough imperfect qualities are in the mix to keep the sense of vitality from a live performance and hint at the intimacy of a chapel service. Over-editing often kills the atmosphere of choral music so I'm glad it has been avoided here. The music of William Deane himself features too and although it is always hard to judge minor composers of this period alongside the towering figures of Tallis and Byrd, he comes across as gentle and charming. The last track – 'The Grace of Our Lord Jesus Christ' – is a particular treasure, and a fitting close to a fantastic programme. Stephen Rice clearly has a nose for under-represented music and this new disc is a worthy addition to Hyperion's impressive catalogue. This recording was made with assistance from the University of Wales and the School of Music at Bangor University and it is good to have the notes in a Welsh translation. These Hyperion releases are always well thought-out and pleasingly executed and their partnership with The Brabant Ensemble looks like it has a very exciting future indeed.